Check out our fantastic hostel today and see for yourself, what your missing out on! "In an area where backpackers are a dime a dozen there’s always the danger that budget accommodation just won’t make an effort. Not so for this colourful Hostel where cleanliness is as important as having a good time - and that’s considered very important!" 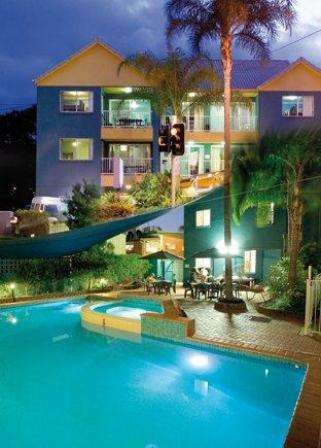 We are located at 44 Queen Street, Gold Coast, Queensland, Australia 4215. Directions to Aquarius Backpackers: Tram: $4 to $6, 24 hours on Friday and Saturday nights, until 12am the rest of the week. We are across the road from the Southport South tram stop. Train: Brisbane Central to Helensvale Train Station, then bus to Australia Fair and walk 4 minutes south. Plane: Brisbane Airport- to Helensvale Train Station, then bus to Australia Fair and walk 4 minutes south. Coolangatta or Gold Coast Airport- Catch the 777 bus from the Airport to Broadbeach and then catch the tram from Broadbach to Southport South tram stop. We are located across the road from the tram stop. Or call Aquarius and we can organize an airport transfer from $30 to $50 per person. We just need your flight details. - Our hostel is fully licensed, so you cannot bring alcohol inside the building. - Absolutely no alcohol is allowed in rooms. - You must supply either a passport or drivers license upon arrival. - Upon cancellation you will be charged for the first nights accommodation for each guest. Any payments made in advance will not be refundable. - We do not conduct check-outs or check-ins on Christmas Day or New Years Day.